“I’m in Switzerland now, on a train to Zurich,” came the voice on the other end of the line, coming in via Skype from a rail car in Europe. That’s been life for UO art student Laurenne Ross since December. Ski in Switzerland. Pack. Drive to France. Unpack. Ski. Repack. Drive to Austria. Unpack. Ski. Repack. Drive to Italy. Unpack. Ski. Repack. Fly home to Oregon. Unpack. Repack. Fly to Germany. Unpack. Ski. Repack. Train to Switzerland. Fly to South Korea. Unpack. Compete in the PyeongChang 2018 Olympic Winter Games. These Olympics are Ross’ second, after a trip to Sochi in 2014 that saw her finish 11th in the downhill in her Team USA debut. 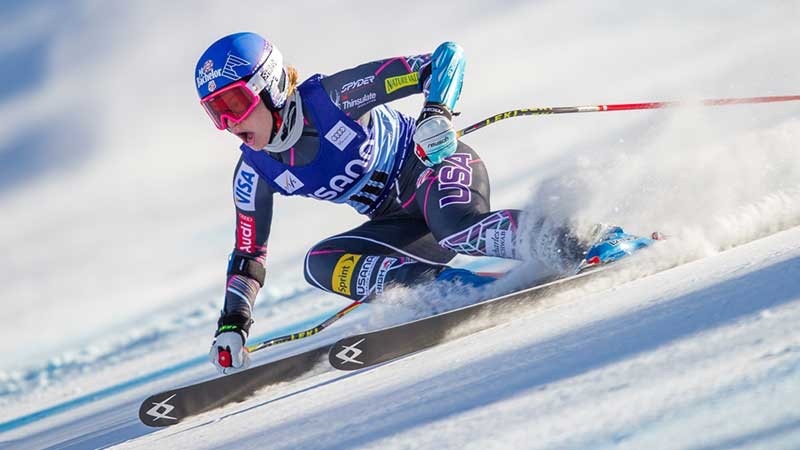 They come after a 2016–17 season that saw her record seven top-10 finishes on the World Cup circuit, including a fourth-place finish in the downhill and a sixth-place finish in the super-G on the Jeongseon Alpine Centre course that will be used in this year’s Winter Olympics. They also, however, come just 11 months after a horrific crash at the U.S. Alpine Nationals in Maine that could have ended her career. Racing in the giant slalom just for fun, two days after winning the super-G title, her skis slipped out from under her in the stormy conditions. While regaining her balance, she clipped a pile of fresh snow with the outside edge of her right ski and went down. While flying downhill at 70 miles per hour, Ross slammed into Sugarloaf Mountain’s packed snow, tearing her right knee’s ACL, LCL, medial meniscus, lateral meniscus and popliteal-fibular ligament; dislocating her tib-fib joint; and breaking her tibial plateau, leaving her writhing in pain on the course. Essentially, anything that was working fine in her right knee when she left the start gate was either broken or torn upon impact. Forget scenic train or car journeys through Europe — Ross’ next trips were a sled ride down the mountain, a flight to Colorado for knee surgery, and a flight home to Bend to begin months of rehabilitation that were as painful physically as they were emotionally. Typically, Ross’ training and competition schedules mean she’s only enrolled at the UO each spring to continue working toward her degree. However, the time she spent away from the slopes in 2017 rehabilitating her knee meant she had time to take online courses in design careers and individual branding strategies from the UO. 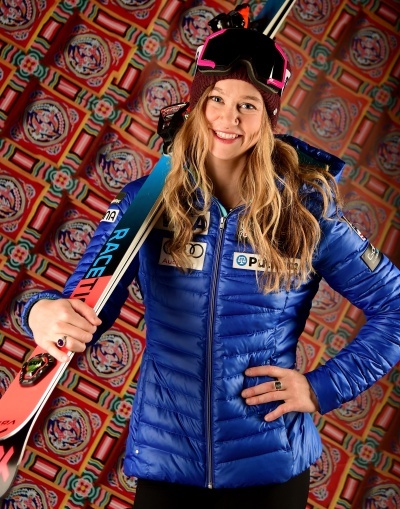 The Laurenne Ross who will be wearing the red, white and blue of Team USA in PyeongChang will be more than just a more mature artist, photographer and designer than the one who raced in Sochi four years ago; she is also a more mature skier, and she knows what to expect from one of the world’s biggest sporting events. “It’s been different this time, knowing what it’s like actually going,” Ross said. “Obviously with my injury it’s been a lot different, trying to come back from that in time and having the Olympics as a goal. I was so wide-eyed last time. I didn’t know what I was getting myself into. It was an incredible experience, but I’m excited to go back with more of a veteran perspective and embrace the things I enjoyed last time, gain some more experience and have some fun while I’m doing it. All dates and times PST.